This morning I joined my sisters and brothers of Rhode Island’s faith and civic communities at The Rhode Island Council for Muslim Advancement for a press conference in Support of Rhode Island’s Muslim Community. Below are the words I shared at the event. My Church of England tradition came to this country and had to give up its status as a government sanctioned faith. It took us years to learn that the American vision of freedom of religion, of the strict limitation that keeps our elected officials from prescribing any person’s faith or establishing one set of beliefs over another, is by far the better way. As a US citizen and as an Episcopalian, an Anglican, I can not imagine our nation betraying its great visionary stance, one which has been followed again and again in new nations in the following centuries. 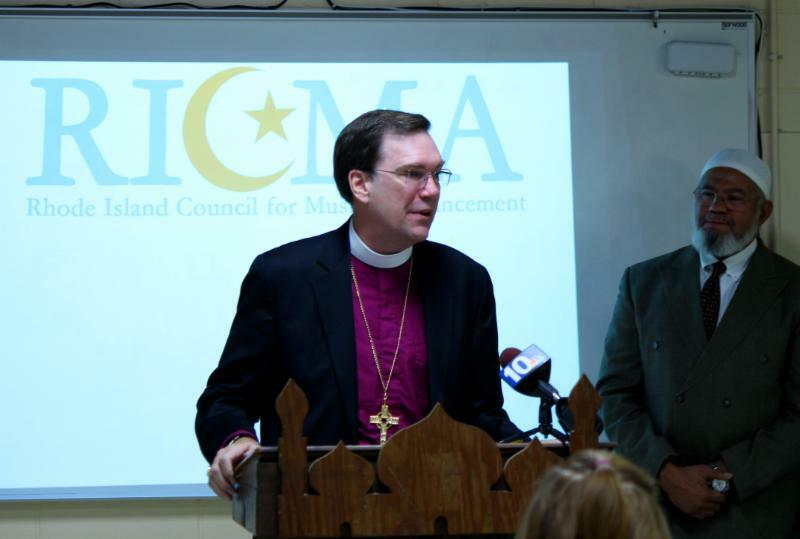 That is why it is so important for Americans, for Rhode Islanders, for people of faith to reject the voices that are calling for us to treat people of one faith differently than all others. The idea that how you pray creates an automatic suspicion that you are not a loyal American citizen is much more dangerous to the health of our nation than any possible threat of extremist violence. My faith community has come to depend on the Constitution and the equality and the call to serve the common good that are its heart. I ask us all to put our fear behind us and to live up to the ideals that have guided us since our nation’s founding.